This book review is not for a UX book, but for one that I think a lot of people will get a lot from. It is for anyone who wishes they could quit their day job and spend the time doing something else instead, whether that be creating something or doing some other job - maybe too low paying to support you, but that would fill that gap in you. Late last year I read a Medium post called The Crossroads of Should and Must. To be honest it blew my mind a bit. And when I saw there was a book to go with it, I had to get that too. As I read it I could recognise myself - I already follow my Must, maybe not to the point of quitting my day job, but my evenings and weekends are full of making and creating. I have always made time and space for these things because I am not me if I cannot do them. And I have at least managed to find a job that allows me to be creative, drawing and problem solving all day long. But as I read I felt anxious. While I know I am a maker I have always felt there should be more to it than just that. I love to make things, whether they are knitted toys or a website interaction, a paper animation or a cake. It is the making I love, and while the end result is important (how else do you know you have finished?) it is not normally the end result I want but the process of making; of trying something out; of learning a new skill. Most of the crafty things I make are given away either to friends or charity, but I feel I could do more with this, without stopping the variety I have right now. I do not want to be tied down to just one thing, be that knitting or paper craft or book binding. So when I got to chapter 5 and read ‘When does this (your Must) intersect with the rest of the world?’ suddenly my problem became clear. It did not answer my problem but gave it a title and now I know what to think about and focus my efforts on. 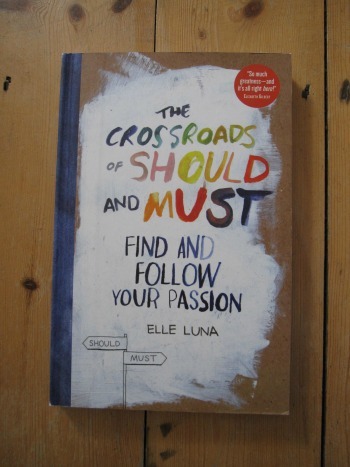 This is a book for anyone who feels the Must in their life but does not necessarily know what to do with it. Maybe you loved to draw at school, but now all grown up you do not know how to bring it back into your life - this book is full of practical ways to move your Must forward. It was also a really quick and engaging read. Full of colour, you do not know what to expect from page to page. Even if you do not read the book, read the blog post and see if it inspires you. Who knows where it might take you.